Produktinformationen "ALIENS SCORPION ALIEN ACTIONFIGUR"
From NECA. Series 13 in NECA's bestselling Aliens line is dedicated to the classic Kenner Expanded Universe Aliens of the early 1990s! It includes the long-awaited debut of Space Marine Sgt. Apone as well as the frequently requested Snake Alien and Scorpion Alien. Space Marine Sgt. Apone stands approximately 7" tall and features an extraordinary bio-mechanical right arm and heavy-duty grenades on his back. The figure is highly articulated and comes with a rifle accessory. Snake Alien feature a 12" long bendable tail and ball-jointed fingers for attacking its unlucky prey. 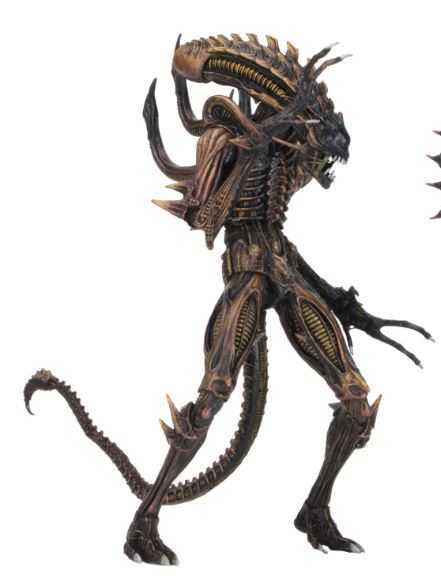 Scorpion Alien has over 30 points of articulation. Both highly detailed figures measure over 9" tall. The clamshell packaging is an homage to the classic Kenner art, featuring custom illustrations and a color palette reminiscent of the toy shelves of the early '90s. Weiterführende Links zu "ALIENS SCORPION ALIEN ACTIONFIGUR"
Kundenbewertungen für "ALIENS SCORPION ALIEN ACTIONFIGUR"